“Talking Heads” is a term most often used in reference to political figures and news broadcasters. In the world of marketing, it means a new way to engage consumers with QR codes. It started with Victor Petit, an art direction and multimedia graduate from Sup de Pub ins France. When applying for jobs after graduation, Petit plastered his face on resume and cut out a box where his mouth should be. In its place was a QR code, which could be scanned to activate a video in which Petit would verbally dictate his experience. The concept was so inspiring, that Reporters Without Borders replicated it when decrying to acts of dictators in and around the Middle East and Africa. The idea of turning a static image into a moving and engaging product is something that advertisers adore. Dynamic marketing is becoming the best way to engage consumers who are increasingly entangled with mobile technology. Marketers have found that consumers are more likely to purchase a product if they are met with interactive marketing techniques. 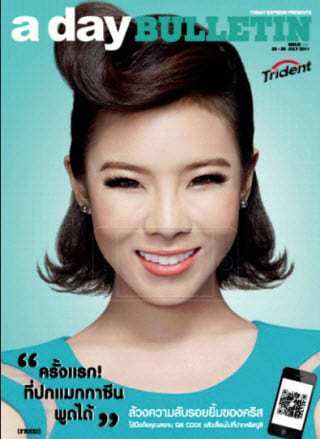 And so, Trident Gum has launched a new interactive marketing campaign in Thailand that uses the concept of the talking head. Full-page ads have been appearing in Bangkok’s popular urbane lifestyle magazine “a day BULLETIN,” which features a woman’s face with a transparent outline of a smart phone around her mouth. A QR code is tucked away in one of the corners of the ad. The code resolves to a video of the woman’s mouth, which mobile users can place over the outline on the ad and watch her speak.